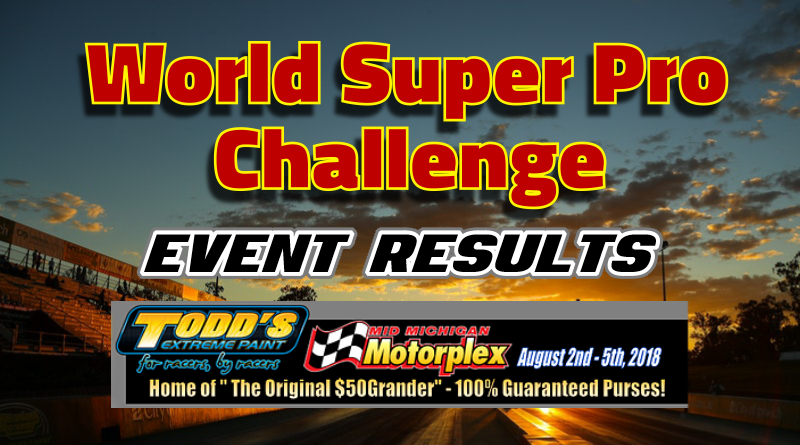 Stanton, MI – The 25th Annual World Super Pro Challenge kicked off on Thursday at the famed Mid Michigan Motorplex – home of the original$50 grand race – with the first of several big money bracket races scheduled for the weekend. Thursday’s action included the Digital Delay $10k race. After the smoke cleared, Scott Taylor of Portage, MI drove to the $10,000 win laying down fifteen total in the final to earn the big check. Friday’s action included a number of events headlined by the Pro Systems $10k race. In the semi-finals, Thursday’s main event winner Steve Taylor came up just short of his second straight final when he took a little too much stripe, breaking out .002 against AJ Ashe. The other side of ladder saw Debottis take down traveling big money racer Mikey Bloomfield Jr. to make his way to the final round. It was an all door car final round which found Gulfport, MS racer AJ Ashe taking the $10,000 win in his Pontiac Grand Am after defeating Pat Debottis in his Dodge Dakota pickup. Other action on Friday included the FTI Appreciation race where Mark Niethamer took the win over Jason Enfinger. Jeff Serra won the Open Gambler’s race over Tyler Sizemore. In the Door Car Gambler’s race, Cory Mikus defeated Mike Stokes. Pat Debottis drove his way to his second final round of the day but once again came up short as Tim Slone captured the win in the Over 50 final round. Saturday was main event time with $50,000 on the line. The semi-finals included Jeff and Lane Ledford, Troy Williams Jr., and Chris Stine. Stine took out Lane Ledford with a .016 package while Jeff Ledford came up short against Williams on the other side of the ladder. Although neither Ledford made it to the final, both making the semi’s was an impressive feat. In the final, Stine laid down his second .016 package in a row which was just enough to take down Williams for the big check. Hot off the heels of deep runs in the Saturday $50k, the Ledford’s dominated again on Sunday as Jeff and Lane met in the $5k final round with Jeff taking the win. Jeff laid down 13 total in the final to cap off a great weekend for the Ledford family.